Could a long-dormant complex of volcanoes on Rome's doorstep be the key to Rome's destruction in an ancient prophecy from Archbishop Malachy? Having shown no sign of activity for the last 36,000 the long-empty magma chambers beneath the volcanic hills are once again filling up with red-hot gasses and molten rock. 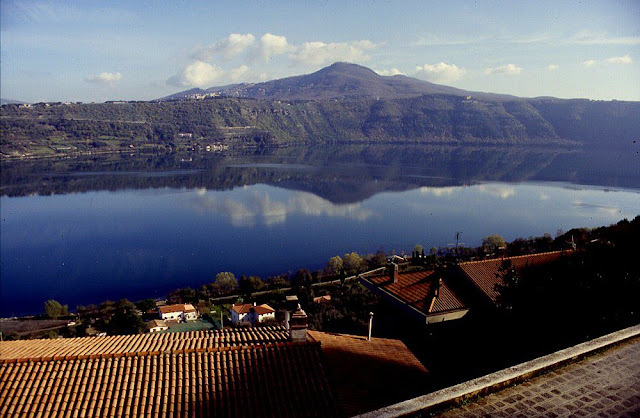 A long-dormant complex of volcanoes on Rome's doorstep is slowly filling up with liquid magma and will erupt once more, according to scientists at Italy's National Vulcanology and Geophysics Institute (INVG). Scientists made the startling discovery while carrying out research into the historical eruption patterns of the Alban Hills volcanic complex over the last 600,000 years. "The surprising results reveal these volcanoes are anything but extinct," explained INVG geophysicist Fabrizio Marra, who studied the hills with colleagues from Rome's Sapienza University. "They are moving out of a dormant state and are waking up." Having shown no sign of activity for the last 36,000 years, the lush green Alban Hills are today a popular spot for day-tripping Romans, located just 20 kilometres south of the capital. Scientists say the long-empty magma chambers beneath the volcanic hills are once again filling up with red-hot gasses and molten rock. A number of indicators have confirmed the findings, including recent satellite data which show the hills are rising up by 2-3mm each year due to the build-up in pressure below the ground. Geological cracks and fissures in the area also show signs they have expanded considerably over the last 2,000 years - the blink of an eye in geological terms. "We will now need to closely monitor the volcanic area for the foreseeable future," explained Mara. But while it has been confirmed that volcanic activity is on the rise, experts say lava won't be spilling from craters in the Alban Hills anytime soon. In 1139, then Archbishop Malachy went to Rome from Ireland to give an account of his affairs. While there he received a strange vision about the future that included the name of every pope, 112 in all from his time, who would rule until the end of time. We are now at the last Pope in his prophecy. The prophecies of the Irish Saint Malachy, the 12th century bishop of Armagh, have thrilled and dismayed readers for centuries. He stated, Petrus Romanus would be the last Pope and during his reign comes the end of the world. So Francis could be the last.